← Seriously – Another Hurricane? 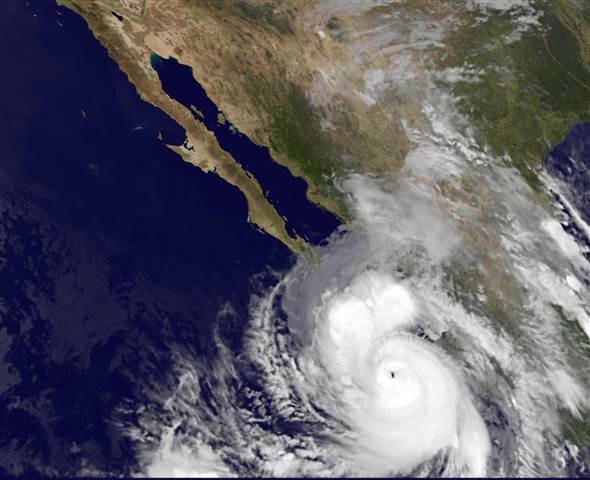 With Odile just miles from Cabo San Lucas, winds and rain blast their way across the region. 22 airlines canceled flights in and out of city. Evacuations of up to 30,000 people are possible. Forecast is for up to 18″ of rain – okay – that’s a LOT OF RAIN!!! And sustained winds at around 135 mph. The imagery looks as if the storm is swallowing the Baja. This entry was posted in Baja Living, Cabo San Lucas, flash Floods, Hurricanes, Loreto, Weather, Winds and tagged Cabo San Lucas, flash floods, Hurricane Odile, Loreto, rain, storms, tropical depression. Bookmark the permalink. Are you there right now? If so, please head inland! And keep us posted. 18″ would be awful. Next month I head down to my little spot in Sonora and will see the damage done by the last hurricane. This one could take down the rest of the sea wall if it’s bad, so my fingers are crossed, for sure. In the meantime, please be safe. This looks really frightening on the weather maps following the mountain chain up Baja I know you and Val are great sensible women but I am praying for you anyway. I would be scared senseless. Love you John T.